2016 Tour de France Cycling Holiday - Bordeaux to Barcelona via the Pyrenees and Tour de France! See the Tour de France! Ride the Pyrenees! Tourmalet, Peyresourde, Aspin, Hautacam, Aubisque. Climb the famous cols of the Tour de France. Cycle in southern France and Catalan Spain. Cycling Holiday of a lifetime! OUR HOTEL IS LOCATED CLOSE TO THE MAIN RAILWAY STATION and airport bus terminal FOR EASY ACCESS WITH BIKE BAG/BOX. Options include a direct flight to Paris (21 hours from east coast Australia) followed by TGV (fast speed rail) from Paris airport to Bordeaux centre in 4 hours! Contact us or our recommended travel agent for information or assistance. Check out more photos in our Bordeaux to Barcelona ride Photo Gallery. Today we climb the famous Tour de France climb, the Col d'Aubisque (1709m). It's a 17km climb from Laruns and the scenery is spectacular! We descend via the Col de Soulor. Mountain goats amongst us also have options to climb the Hautacam and/or Luz Ardiden today. We stay in the buzzing mountain town of Luz St Sauveur. Today we ride undoubtedly one of the most famous cycling climbs in the world - the Col du Tourmalet. This hors categorie climb is 19km long with an average gradient of 7.4%. It's an epic climb, steeped in history of the Tour de France. After a sweeping descent through ski-villages we ride the Col d'Aspin to our overnight stop in St Lary Soulan. Today the spectacular mountain scenery continues - we are on quiet roads to beautiful lesser known Pyreneean climb of the Col du Val Louron Azet, which features in Stage 8 of the 2016 Tour de France. We then tackle the famous Col de Peyresourde (1569m) with it's awesome hair-pinning descent to Bagneres du Luchon. "Luchon" is a cosmopolitan spa-town, celebrated for its thermal springs and with all the amenities one would expect in a resort town. It is our base for the next 3 nights and we enjoy a hotel in the centre of town. 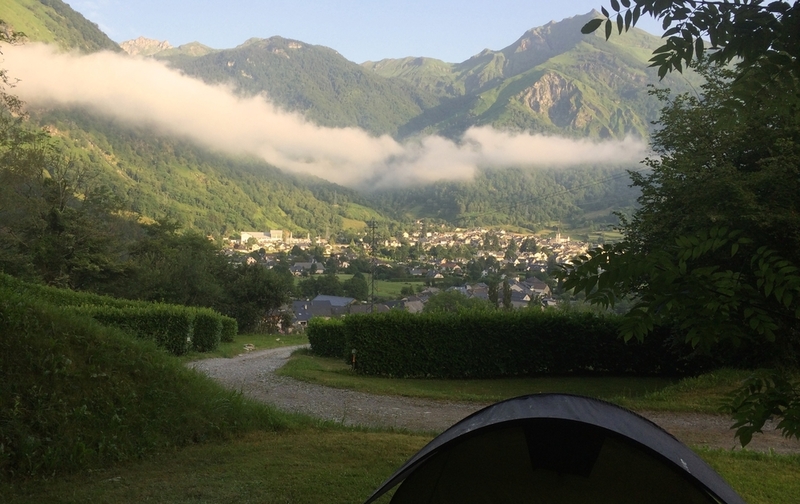 We have three nights and two full days in Bagneres du Luchon to watch the Tour de France as it passes through the Pyrenees. Luchon is a cyclists paradise, surrounded by spectacular mountains and located at the foot of many famous Pyrenean climbs. The town will be buzzing with atmosphere as it hosts a Tour de France Stage Finish during our stay. On Friday 8 July, we will watch Tour de France Stage 7, to the Lac du Payolle as the race enters the Pyrenees and the climbers will begin to attack. Stage 8 on Saturday 9 July is a great classic of the Pyrenees, 183 gruelling kilometres from Pau to Luchon, taking in the Col du Tourmalet, Hourquette d'Anzican, Col de Val-Louron-Azet and Peyresourde. We will be up close to the action, cheering the riders on for this darling stage of the Pyrenees. During our stay, there will also be opportunities for 'extra' climbs (Superbagneres ski station and the Port de Bales are just outside of Luchon) and also time to relax and soak up the atmosphere of the Tour. We depart Luchon climbing the wooded Col de Portillon, crossing the border in to Spain! Hola! In Vielha we get to watch a Tour de France Stage 9 Start! You can get up close and personal with the riders, amongst the team buses and cars. We are in the Val d'Aran (Aran Valley), and have a final short climb to our overnight stop in Arties, a pleasant hillside village surrounded by 2000m high mountains. We camp by the river and eat at a fantastic tapas bar. Today we follow the route of the previous day's Tour de France. We climb along the Aran valley, where stunning hairpin bends take us to the mighty Port de la Bonaigua (2072m). It's a sweeping 30km descent beside the river Noguera Pallaresa, meandering through rocky gorges to Sort. our route closely follows stages 8 and 9 of the 2016 tour de france, taking us over 7 climbs of the tour route: tourmalet, aspin, hourquette-anzican, louron-azet, peyresourde, bonaigua & canto. this is pyreneean riding at its finest! We depart Sort and climb the Col d'El Canto, also known as the Port de Canto. A picturesque climb, it starts with a twisting ascent, with gradients of 6 to 7% before levelling off and offering stunning views of the Sierra del Cadi mountain range. The descent to La Seu d'Urgell is fast and spectacular. La Seu d'Urgell is famed for its fine cathedral and markets. There are some fantastic restaurants and tapas bars or there's an optional additional afternoon ride in to Andorra. On Saturday 16 of July, you need to organise your own onward travel arrangements from Barcelona. Barcelona has an international airport with flights to European destinations and the rest of the world including direct flights to Australia. There is a major railway station with fast-speed rail connections throughout Europe. If you wish to stay in Barcelona for a few extra days, we can organise extra hotel nights for you. Or why not join us for our Milan to Venice ride for an epic month long cycle holiday!? Read about how to join these holidays together here. TOUR COST IS AUD $4890 per person, twin share.